Monument Rocks - All photos by Jim Mason Although dry here in recent years, the Smoky Hill River once had enough flow to carve unique "badlands" in the fossil-rich chalk layers of western Kansas. One of the best-known formations is the area known as the Monument Rocks, sometimes referred to as the Chalk Pyramids, and officially recognized by the National Park Service as a National Natural Landmark. In addition to the unusual geology, the area also offers some interesting habitat for wildlife. Small holes in the formations provide nesting cavities for our smallest falcon, the American kestrel. Pigeons also fly from ledge to ledge as they commonly do in most cities. Here we gain an understanding of this introduced bird's natural habitat in Europe and why they are also called rock doves. Pronghorns inhabit the surrounding shortgrass prairie. Although they are large mammals, their colors make them surprisingly difficult to see. Also in the area are coyotes, black-tailed jackrabbits, lesser earless lizards, and the venomous western rattlesnake. Birders find Cassin's sparrows, ferruginous hawks, and golden eagles of special interest. Common birds include horned larks, vesper sparrows, western meadowlarks, and black-billed magpies. Winter brings prairie falcons, rough-legged hawks, and large flocks of Lapland longspurs. The window at Monument Rocks is a favorite spot for photos. 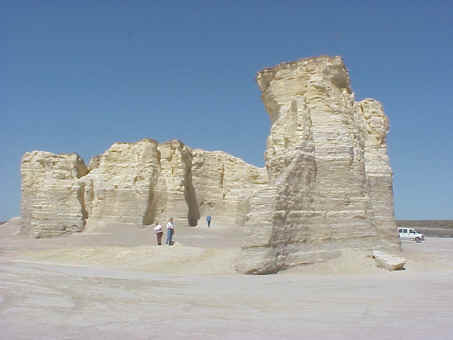 The "Badlands" of Kansas, famous for its fossils, is an area of chalk bluffs, chalk flats, and chalk pinnacles. Eighty million years ago this region was an open ocean brimming with calcium-shelled microscopic animals (foraminera), giant oysters, sharks, bony fish, and reptiles swimming and flying overhead. The tests (little shells) of trillions of foraminera fell like snow to the bottom as they died, forming thick limey ooze, which enveloped the corpses of larger animals. Through time the ooze was covered by other sediments and pressed into chalk (a soft limestone). Thousands of years of sculpting by the Smoky Hill River have left what you see today. 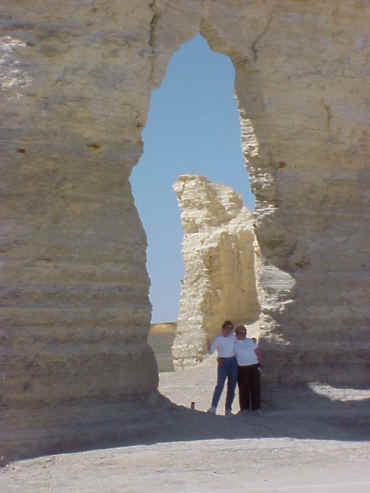 This geological formation is the Niobrara Chalk, named after bluffs of the same chalk on the Missouri River near the mouth of the Niobrara River in northeast Nebraska. For further exploration of this region, acquire maps of Logan, Gove, and Trego counties and try the back roads that criss-cross the river. There are few good east-west drives, and many of these roads are impassable when wet! Sharks' teeth and other fossils are exposed after rains erode the gravel and rocks. Thousands of shark teeth and other fossils can be examined at the Fick Fossil and History Museum in Oakley. The famous fish-within-a-fish fossil - as well as giant turtle, swimming and flying reptile fossils - can be seen at the nationally recognized Sternberg Museum in Hays. The walk-through Cretaceous diorama (complete with a life-size roaring T Rex!) is a must-see! The Sternberg also has Miocene fossils of rhinoceros, camels, horses, and saber tooth cats taken from Rhinoceros Hill in Wallace County and other private quarries in Kansas. Click the icon to find a birding list for Gove County. Directions: The Smoky Hill River crosses U.S. 83 about 25 miles north of Scott City. North of the river 2.5 miles a sign directs visitors another 4 miles east and 2 miles south to Monument Rocks.